For many people it does not matter what their dog eats but as a caring owner, you should be aware of what goes into the diet that will add up to an ultimately happy pug. Whatever your pug consumes directly influences its health so very simply, a good diet is what will equate to a happy pug. You see pugs can gain weight very quickly, which can result in them suffering from breathing problems. Because of this many pug owners like to know exactly how much they can feed their dog. Here are the basic nutritional meals you can feed your pug at home. Scrambled eggs with Veggies are a good meal that can give your pug the energy they require. If you are serving them two eggs, always get rid of one yolk and whisk the whites in milk. Serve after letting it cool for a bit. Stewed chicken goes well with brown rice when it comes to a healthy snack for your pug. Also there may be times when preparing homemade meals may be too much of a chore. Remember to use only dark meat. When preparing, stew chicken legs then remove the meat from the bones and tear them into tiny pieces that a pug will be able to devour. Next remove all the fat by straining the liquid through a strainer and cook the rice in this solution. Once the rice is prepared add the meat and serve. Chicken liver will work as well for this. You need to brown the liver in some olive oil and add the vegetables. Let it cool before serving. Also it is recommended that you add a tablespoon of fresh yogurt. Do not save up on leftovers. This is not only healthy but your pug will find it very delicious as well. All that you need to do is cook the meal in vegetable oil a little till its brown. After that add some vegetables (anything but corn and peas) like a baked or sweet potato. Serve when it’s cool enough. After that you can even refrigerate any leftovers for later. 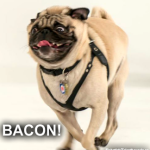 Despite what advertisers tell you there is no commercial dog food recipe that is perfect for your pug. If you want your pug to be healthy and happy it would be best if you did not take any risks with the commercial diets. Plus why would you even want to when these nutritional meals are so easy to make? Free feeding is only suggested for pugs less than 3 months old. Free feeding refers to when you leave out food for the dog for it to eat throughout the day any time they wish. This is for several reasons. The breed can become overweight and like humans they can put on excessive weight. In addition, house dogs have a schedule for everything like sleeping, grooming and eating so eating out of their schedule will most likely put them off of it. Also, and generally speaking, if you get your pug off their feeding schedule you’re more likely to end up with poop and other bathroom accidents in the house no matter how well trained he/she may be. Put yourself in the pug shoes and imagine how hard it would be to hold it for hours on end. Treat your furry little family member with a nutritious diet to keep it healthy and happy. Both you and your pig will be happier for it. 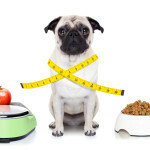 Home blog What Is the Perfect Diet For a Healthy and Happy Pug?